Building 429 has been one of my favourite bands within the last few years. Since the years in the early 2000s where they were an independent band, to when they were signed by major labels and released albums through INO Records, Word Label Group and Provident Label Group- that spawned radio hits like ‘Glory Defined’, ‘Always’, ‘End of Me’, ‘Fearless’, ‘You Carried Me’, ‘We Won’t Be Shaken’, ‘Where I Belong’, ‘Press On’, ‘Unashamed’ and ‘Ocean Deep’, to name a few; Building 429 have won the hearts of many of their fans since the beginning, providing inspirational and uplifiting songs throughout their entire career. Upon the heels of their most recent album Live the Journey that they unveiled to us all late last year, we see the band delivering another stellar song in ‘Fear No More’, this time released not under Provident Label Group (Live the Journey was released under that label! ), but rather released under Building 429’s own label, Third Wave Music. The song itself? Discussing about fear; and tapping into the feeling we as humans want to push aside so bad. Featuring the backing vocals of Brooke DeLearey of LOVECOLLIDE, this now independent Building 429 continues to wow and impact, inspire and maybe at times challenge with this new song that allows us to contemplate whether we ourselves fear in our lives more often than we should. 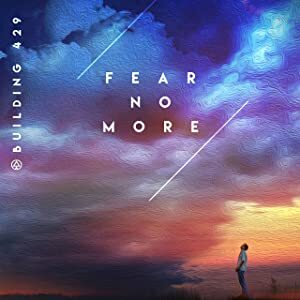 ‘Fear No More’ is an anthem, and though released independently, Building 429’s track record is enough for maybe, just maybe, the powers at be that choose song selections for WOW Hits to place ‘Fear No More’ on WOW Hits 2020? With a few more months until WOW Hits 2020 track listing is announced, we shall wait and see. And so, what shall we do now between this new song and whatever new EP/album release is coming next? Well, listen to this song on repeat, of course. Or just shuffle on all of B429’s songs when we play them on Spotify. And thus now, we end this review with a quote from the band themselves in a recent devotional interview they undertook with NewReleaseToday.com about the song and what their hopes for it are! Well done Jason and the rest of Building 429 for such an empowering song, hoping and praying that ‘Fear No More’ continues to impact us all in the upcoming months ahead! Every step of “Fear No More” has been an exercise of saying, “I don’t know where this is going to end, but I’m not going to fear in it.” I wanted to write a song that spoke to the reality that many times, the things we wouldn’t ever choose actually lead us directly into the most beautiful, life-altering moments where the reality of God’s presence is beyond a doubt. Whatever challenge you may be facing in this time, I hope “Fear No More” reminds you that God is with you in the trial; that while every great book has moments of doubt, the hero is always with us, and the final chapter is yet to be written. The biggest reason we fall prey to fear is that we believe the biggest lie that Satan tells us: that we’re alone. When you realize how precious you are to the Lord, that he stands beside you and takes your suffering on Himself through Jesus Christ; it’ll give you a different perspective on the struggles that you face.